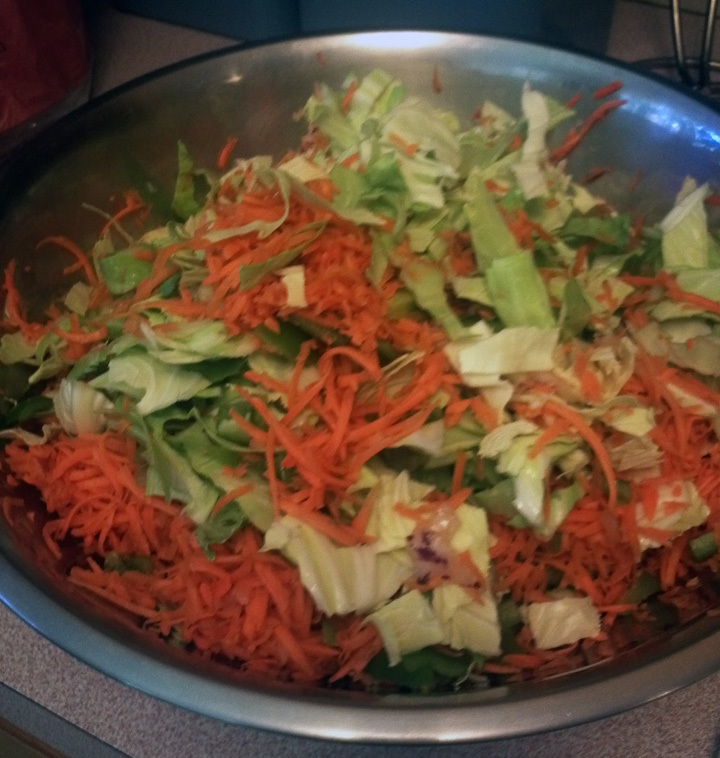 Harvest Creations: Yes, you can CAN coleslaw! Is that just the prettiest cabbage you’ve ever seen? It’s harvest time and that’s part of the reason that I’ve been silent here. There are other reasons, but that is the reason I may share. Those who have been following my garden progress know about the great greenhouse catastrophe of 2013. Wherein many of my starts were lost to a big storm that blew through and knocked down the greenhouse. It blew seeds everywhere, as well as upending baby starts. The upshot? 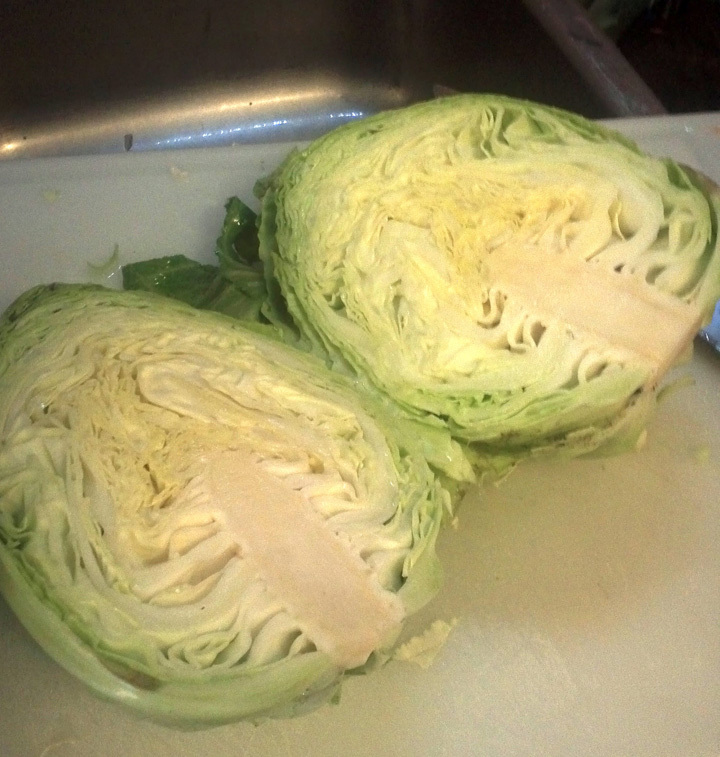 I have a ton of brassicas vegetables, but also a huge supply of cabbage. So far I’ve made Chinese chicken salad, fresh coleslaw, stuffed cabbage, stir-fry….but, I was looking for a way to preserve this bounty into the winter time. I found this recipe for canning coleslaw. So, I decided to try it. It was easy, it was fast. And I ate some yesterday, straight from the jar, although you can open the can, rinse and add a regular coleslaw dressing if you like. I’ll likely do a third batch, too, and share with friends. Here’s the recipe with my take on the recipe. The plain text is the original recipe; the italics are my comments. 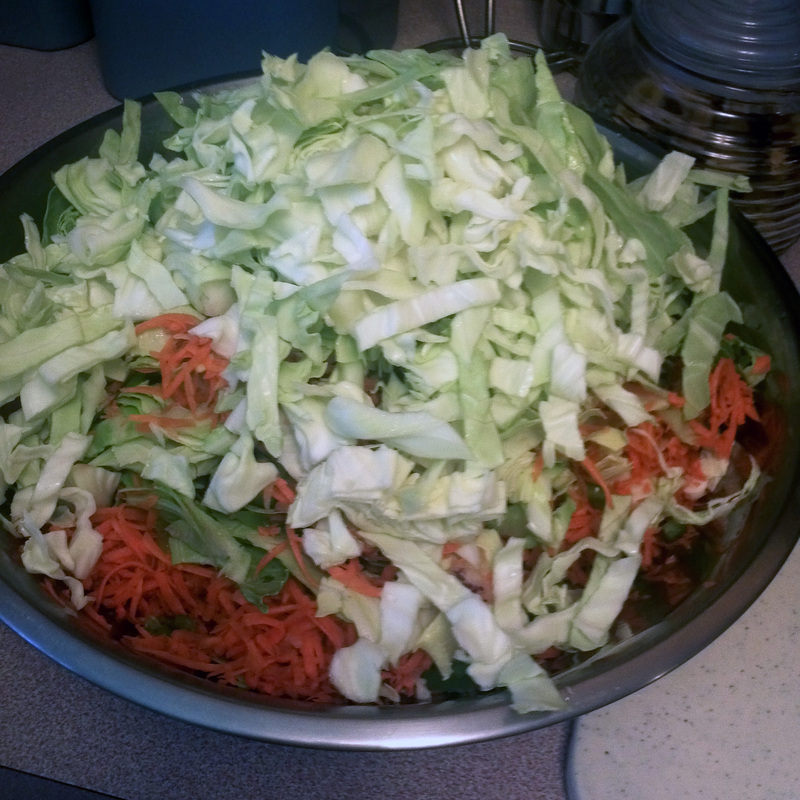 I just basically eyeballed the ratio of cabbage to the rest of the ingredients. Shred together vegetables. Add the salt. Boil syrup ingredients together for 1 minute, cool. Pack into quart jars and process in a boiling water bath for 15 minutes, (if using pints, process for 10 minutes) or put into freezer containers and freeze. Be sure to pack as much as you can in and work diligently to get all the air out. Shred together vegetables. Add the salt. Let stand 1 hour. Drain water from vegetables. Boil syrup ingredients together for 1 minute, cool. Add syrup to vegetables. Process in 7 pint jars and water bath process for 10 minutes. Can’t wait to be eating a taste of summer this autumn and winter! What about the whole ‘don’t can cabbage’ thing? I’m new to canning. Been at it about 2 years and want to push the boundaries a little but safety is my first priority. 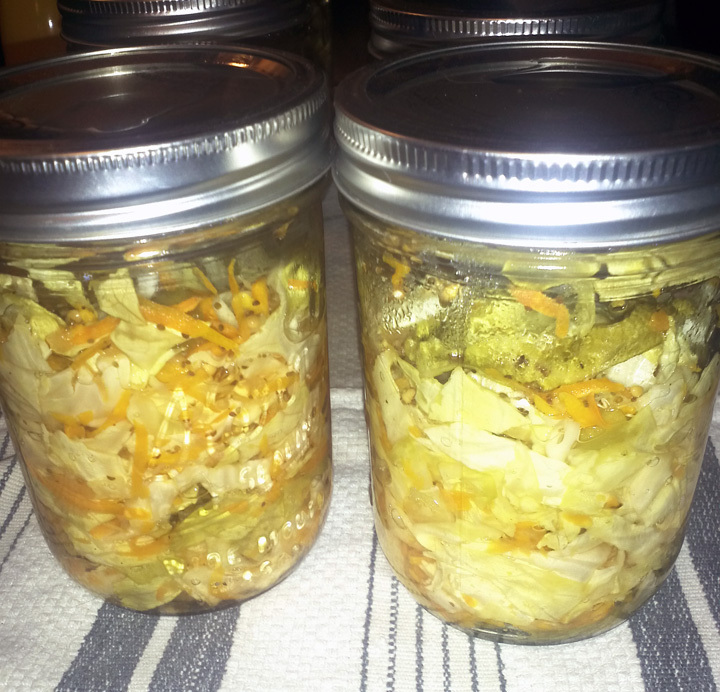 does the cabbage fermentation continue after canning? Will it blow the lid off after a year? We ate every jar of this batch. The fermentation did not continue and it was great to use in stir fries (I rinsed first so it wasn’t too vinegary in stirfry), or as a cold salad, or straight out of the jar. I also used to cook in the crock pot with some kielbasa. It was divine. I didn’t get very much cabbage this year, so no canning. I did not have any lids “blow off.” I don’t think I’ve ever seen that. I was told you can’t can rhubarb and I have done that, too. I think people don’t give themselves enough credit. When food is bad, you mostly know it (smell, taste, sight). Also, why could you can carrots or broccoli and not cabbage? If you try this, please let me know how you liked it. I’m going to disagree with the above post that states you know when food is bad by smell,taste,etc. botulism has no smell or taste and the food doesn’t look bad. This is true, Melissa. I’ve been fortunate to just have the other happen. Following food safety steps when you prep to can is of the utmost importance. I sure hope this is as good as it looks. I have a batch ready to can. How long before we can eat it? You can use right away.